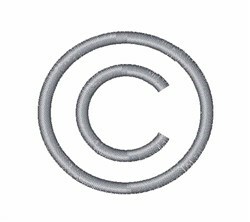 When you digitize your work you need to protect it with this copyright symbol. Add this to any project that you've created! Easy Embroidery is happy to present Copyright Symbol machine embroidery design which has 1601 stitches and is [47.93 mm x 47.92 mm] large. If you would like to view more embroidery patterns please search on our embroidery designs page.